Whether your child is starting child care, kindergarten, or going back to the same school with a new classroom of children this coming week, it’s exciting and a little scary too. The family routine changes and your son or daughter will be faced with new experiences and friends, new ideas and choices. How can you help your child prepare for the big first day? Knowing what to expect, as much as possible, eases possible anxiety. Talk about what your new family routine is going to be like. What time will you all wake up? How will your child get to school? What will your child have for lunch? What will happen after school? Ask your child how he or she feels about starting school and be a good example of remaining calm and positive. You won’t know exactly what activities will happen at school, but there are many children’s books that describe a typical school day. Authors who have a series of books based on one character, usually have a book about starting school. Some books explore feelings and others school activities. Before you read a “going to school” book aloud to your family, read it to yourself and see if it is appropriate for your own child. • Rosemary Wells writes prolifically about universal childhood experiences, including school. 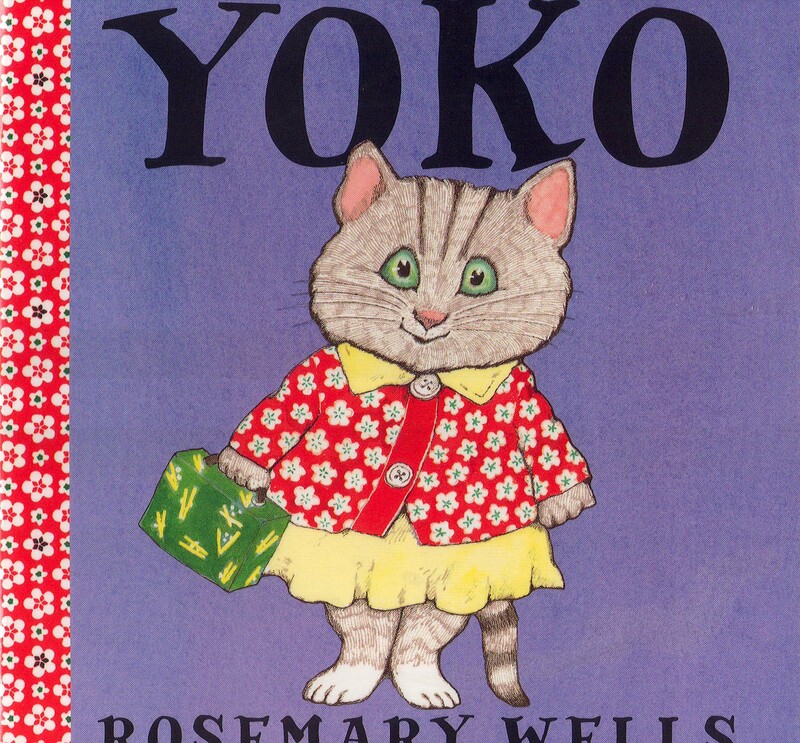 One of her characters, a cat named Yoko, learns about food from other cultures, how to write her name, and what to bring for show and tell in 3 separate books. Wells’s “Kindergator” book series features Harry the alligator and his young classmates in situations that show how one child’s behavior affects everyone else in the group or class. Wells also wrote “My Kindergarten” and “Emily’s First 100 Days of School. • Jonathon London’s “Froggy” character is featured in a series of books illustrated by Frank Remkiewicz. In “Froggy Goes to School,” Froggy has a lighthearted attitude toward school and some humorous happenings on his first day. It’s almost here! A blue moon! On August 31, if the night sky is clear, you will be able to see the second full moon of the month, which is called a “blue moon.” You may have heard the expression, “once in a blue moon,” meaning “almost never,” because having 13 full moons in one calendar year instead of 12 full moons is rare. It only happens in 7 out of every 19 years. The next blue moon will be on July 31, 2015. Studying the night sky with your child is a wonderful family activity. The moon goes through the same cycle every 29 and a half days of getting larger, or waxing, until it is full, then getting smaller, or waning until you can’t see the moon at all at its “new moon” phase. An easy way to tell whether the moon is waxing or waning is to hold your hand to curve around the same way as the moon in the sky. If the curve of a crescent moon fits nicely in your right hand, it is waxing, or growing into a full moon. If a crescent moon fits nicely in your left hand, it is waning, or getting smaller. Check out this method tonight! Is the moon waxing or waning? The moon has inspired many stories and fables for adults and children alike. 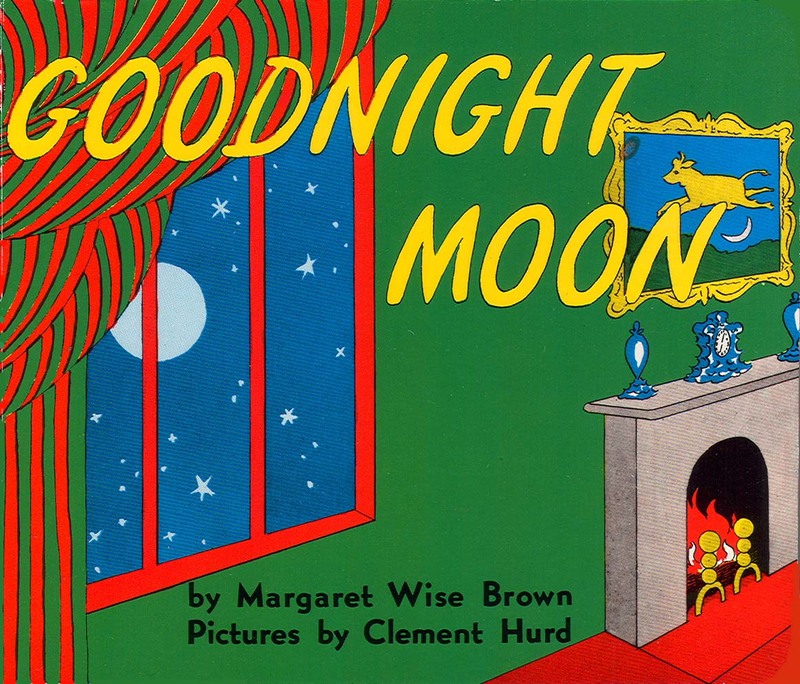 Make sure to read the classic “Goodnight Moon” and “Owl Moon” with your family and maybe try some of the following moon books, which might be new to you. “Little Night” by Yuyi Morales. “As the long day comes to an end, Mother Sky fills a tub with falling stars and calls, ‘Bath time for Little Night!’ Little Night answers from afar, ‘Can’t come, I am hiding and you have to find me Mama!’” Little Night is a playful child with skin as dark brown as dusk and hair as black as night. She puts on a dress crocheted from clouds and bounces the full moon high in the air. This is a lovely, gentle story of mother and child, the night sky and bedtime. “The Moon Ring” by Randy DuBurke. Interesting illustrations that are semi-realistic with some flat color show Grandmother and granddaughter Maxine looking at the blue moon. “Second full moon in a month. Hardly ever happens. Magic loves blue-moon light,” says grandma. When a silvery ring falls from the night sky, Maxine finds herself with four wishes. Her adventures take her from the arctic to the savanna and finally to New York City. Starting with his or her first smile, a baby is on the way to making friends. But the concept of friendship changes drastically as a child grows. At first, a young child is centered on himself. A baby responds positively to familiar faces, but treats other babies more like toys to explore. A pre-schooler’s friends are usually those children who just happen to be close at hand and have the same interests. Friendships are not consistent at this age. By the time a child enters elementary school, she will have had experience sharing and may start understanding other people’s feelings and show compassion. It all takes time and maturity. Making friends helps children learn how to communicate and cooperate. They practice controlling their emotions and try out ways of responding to others. Ultimately, when a child finds a friend who enjoys similar activities and outlook, it makes both of their lives richer. 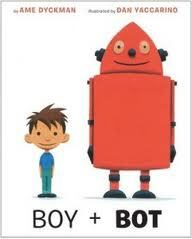 • “Boy + Bot” by Ame Dyckman, illustrated by Dan Yaccarino. The unlikely friendship between a boy and a robot flourishes when they both find out the ways they are the same and agree to accept their differences. • “Nutmeg and Barley: a Budding Friendship” by Janie Bynum. A squirrel and a mouse don’t seem to have much in common. One lives high in a tree in the sunshine and the other lives in a hollow log on the ground in the shade. They try to befriend each other but through some miscommunication, their friendship fizzles. With some work at being understanding, they get over their hurt feelings and realize they have a lot in common after all. • “One Cool Friend” by Toni Buzzeo, pictures by David Small. “Elliot was a very proper young man,” the story begins. This humorous tale of Elliot, his be-speckled father, and a real penguin, take the reader on a wild adventure that shows how much fun a new friend can be. Illustrations are mostly black line drawings with pops of color. The extra details in the pictures make re-reading the book a delight. Nancy Carlson, a native of Minnesota, knew from the time she was in kindergarten that she wanted to be an artist. As an adult she was so determined to make that her career, she never considered any other goal. Now, some 50 years later, she has illustrated and written more than 50 children’s books. Carlson clearly has an agenda when creating her books. She writes about issues children face, but from a positive point of view. Her stories are about being happy, telling the truth, trying your best, and being nice. The upbeat messages are mirrored in the bright colors and bold patterns of her illustrations. A cast of animal or human characters play out the gamut of childhood emotions in her books. Many of them are based on friends or neighbors, starting with Harriet the golden retriever, whose personality is based on Nancy Carlson herself when she was young. In three different stories Harriet has to get over stage fright, share her Halloween candy, and be brave enough to ride a roller coaster. Carlson’s stories may be overly optimistic for some children’s (and grown-up’s) sensibilities, but for others, these books will say just the right thing at the right time. She presents real life in the form of comical moral lessons. And for Carlson, the stories provide the perfect opportunity to do what she really loves–create art! 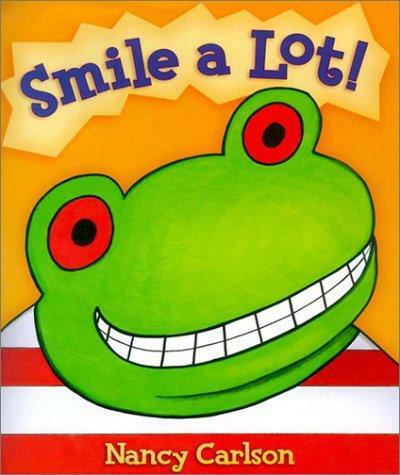 • “Smile a Lot” features Vinney the frog. After reading this book you realize how contagious a smile really is. “Smile a lot. It gets you through hard times. It gives you lots of courage. It helps you reach your goals” …and it’s much easier than complaining! • “Henry’s Amazing Imagination!” features Henry the mouse. Henry used to lie about everything, until he learned how to tell stories for show and tell at school. • “I Like Me!” features Louanne the pig and her “you can do it” attitude. When she makes a mistake, she tries again. When she falls down, she picks herself up. • “Arnie and the Stolen Markers” features Arnie the cat. When Arnie doesn’t have the allowance money to buy some markers he wants, the temptation to take them is just too much. Find out what happens when his mother discovers what Arnie’s done. For more information on Nancy Carlson, visit her website: www.nancycarlson.com. If you’ve ever seen a children’s book that has no words, just pictures, you may have wondered how to even go about “reading” it. How can you read a book to a child when there is no story? Wordless books can be adapted to many levels of understanding. Model story telling and talk about the emotions of the characters in the book. Can your child imagine how the characters are feeling? Together, predict what will happen next. You will be stretching your child’s thinking and using the pictures to expand your child’s vocabulary. Try some of these wordless picture books and enjoy telling stories together! 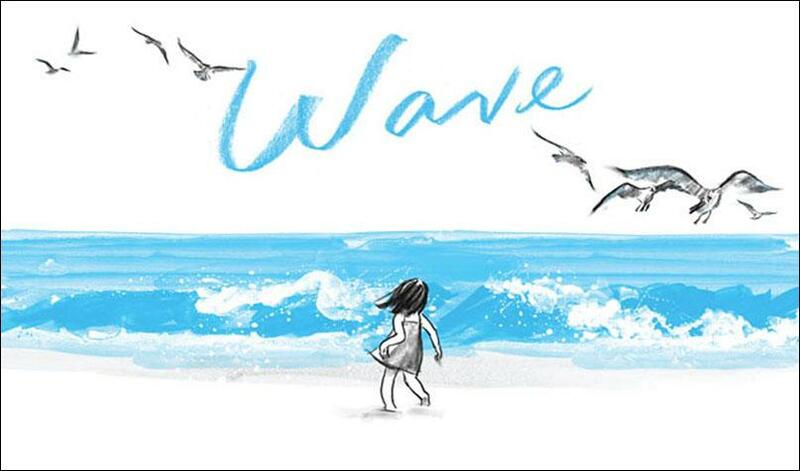 “Wave” by Suzy Lee. Delightful illustrations of one little girl, 5 seagulls, and the seashore in only black ink and blue paint on white paper. We see the girl interacting with the ocean as the seagulls mirror her humorous reactions to the waves lapping up on the sand. 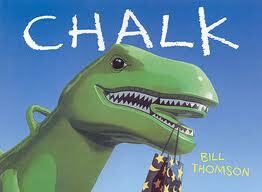 “Chalk” by Bill Thomson. Almost photorealistic illustrations of three children and a bag of chalk on a playground. Their chalk drawings come to life and cause some problems for the children, until the weather changes. “Pancakes for Breakfast” by Tomie dePaola. A little old woman wakes up on a cold winter night and decides to make pancakes. We see the origin of all the ingredients needed for pancakes as she collects eggs, milk, maple syrup, and butter. 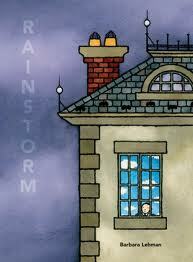 “Rainstorm” by Barbara Lehman. A young man lives a lonely life in a big house surrounded by his servants and dressing formally in a suit and tie for meals. One day when it’s raining, he finds a key to a door that leads him on an adventure to a sunny place where children run barefoot in the grass! “Carl Goes to Daycare” by Alexandra Day. One of many books about Carl the Rottweiler. This is an “almost wordless” book with realistic, loosely painted watercolor illustrations. Carl is one very smart dog; he even seems to know how to read, which is lucky for the daycare teacher.